Make sure your pet is wearing a sturdy collar with an identification tag that is labeled with your current contact information. The tag should include your destination location, telephone number, and cell phone number so that you can be reached immediately during the move. If you’re moving far enough away that you’ll need a new vet, you should ask for a current copy of your pet’s vaccinations. You also can ask for your pet’s medical history to give to your new vet, although that can normally be faxed directly to the new medical-care provider upon request. Depending on your destination, your pet may need additional vaccinations, medications, and health certificates. Have your current vet’s phone number handy in case of an emergency, or in case your new vet would like more information about your pet. Keep medications and food on hand. Keep at least one week’s worth of food and medication with you in case of an emergency. Vets can’t write a prescription without a prior doctor/patient relationship, which can cause delays if you need medication right away. You may want to ask for an extra prescription refill before you move. The same preparation should be taken with special therapeutic foods — purchase an extra supply in case you can’t find the food right away in your new area. Seclude your pet from chaos. 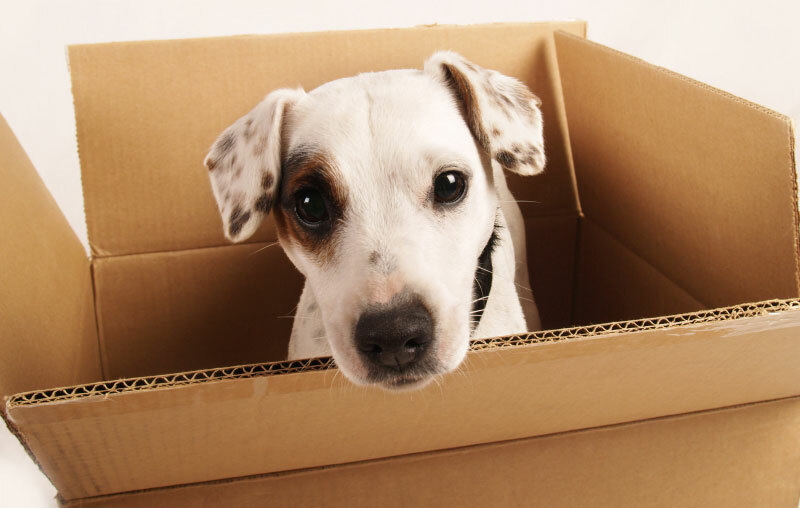 Pets can feel vulnerable on moving day. Keep them in a safe, quiet, well-ventilated place, such as the bathroom, on moving day with a “Do Not Disturb! Pets Inside!” sign posted on the door. There are many light, collapsible travel crates on the market if you choose to buy one. However, make sure your pet is familiar with the new crate before moving day by gradually introducing him or her to the crate before your trip. Be sure the crate is well-ventilated and sturdy enough for stress-chewers; otherwise, a nervous pet could escape. First aid is not a substitute for emergency veterinary care, but being prepared and knowing basic first aid could save your pet’s life. A few recommended supplies: Your veterinarian’s phone number, gauze to wrap wounds or to muzzle your pet, adhesive tape for bandages, non-stick bandages, towels, and hydrogen peroxide (3 percent). You can use a door, board, blanket or floor mat as an emergency stretcher and a soft cloth, rope, necktie, leash, or nylon stocking for an emergency muzzle. It’s best to travel with your dog in a crate; second-best is to use a restraining harness. When it comes to cats, it’s always best for their safety and yours to use a well-ventilated carrier in the car. Secure the crate or carrier with a seat belt and provide your pet with familiar toys. Never keep your pet in the open bed of a truck or the storage area of a moving van. In any season, a pet left alone in a parked vehicle is vulnerable to injury and theft. If you’ll be using overnight lodging, plan ahead by searching for pet-friendly hotels. Have plenty of kitty litter and plastic bags on hand, and keep your pet on its regular diet and eating schedule. When traveling by air,check with the airline about any pet requirements or restrictions to be sure you’ve prepared your pet for a safe trip. Some airlines will allow pets in the cabin, depending on the animal’s size, but you’ll need to purchase a special airline crate that fits under the seat in front of you. Give yourself plenty of time to work out any arrangements necessary including consulting with your veterinarian and the U.S. Department of Agriculture. If traveling is stressful for your pet, consult your veterinarian about ways that might lessen the stress of travel. Find a new veterinary clinic and emergency hospital. Before you move, ask your vet to recommend a doctor in your new locale. Talk to other pet owners when visiting the new community, and call the state veterinary medical association (VMA) for veterinarians in your location. When choosing a new veterinary hospital, ask for an impromptu tour; kennels should be kept clean at all times, not just when a client’s expected. You may also want to schedule an appointment to meet the vets. Now ask yourself: Are the receptionists, doctors, technicians, and assistants friendly, professional and knowledgeable? Are the office hours and location convenient? Does the clinic offer emergency or specialty services or boarding? If the hospital doesn’t meet your criteria, keep looking until you’re assured that your pet will receive the best possible care. Prep your new home for pets. Pets may be frightened and confused in new surroundings. Upon your arrival at your new home, immediately set out all the familiar and necessary things your pet will need: food, water, medications, bed, litter box, toys, etc. Pack these items in a handy spot so they can be unpacked right away. Keep all external windows and doors closed when your pet is unsupervised, and be cautious of narrow gaps behind or between appliances where nervous pets may try to hide. If your old home is nearby, your pet may try to find a way back there. To be safe, give the new home owners or your former neighbors your phone number and a photo of your pet, and ask them to contact you if your pet is found nearby. Learn more about your new area. Once you find a new veterinarian, ask if there are any local health concerns such as heartworm or Lyme disease, or any vaccinations or medications your pet may require. Also, be aware of any unique laws. For example, there are restrictive breed laws in some cities. Homeowner associations also may have restrictions — perhaps requiring that all dogs are kept on leashes. If you will be moving to a new country, carry an updated rabies vaccination and health certificate. It is very important to contact the Agriculture Department or embassy of the country or state to which you’re traveling to obtain specific information on special documents, quarantine, or costs to bring the animal into the country.